IF the Gift clicked on doe NOT (yet) have a Post for that date, show some kind of “Coming Soon” message. 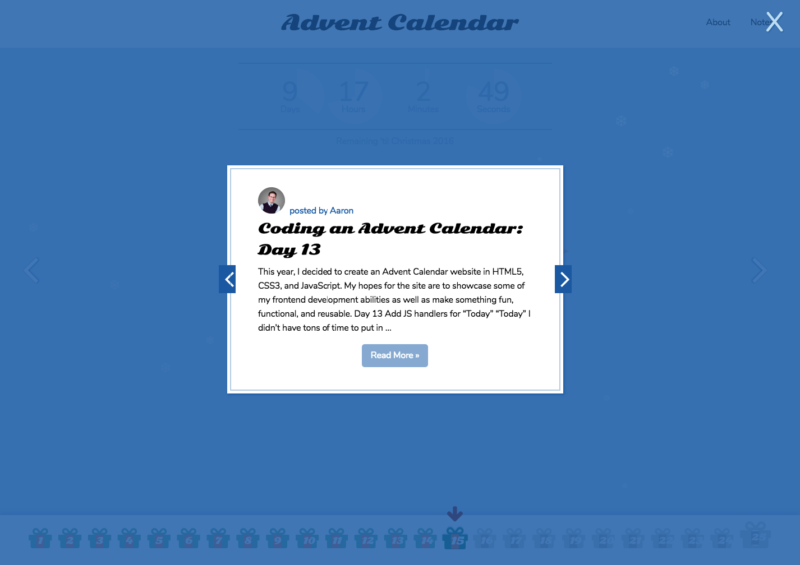 The Posts need to either be in a Carousel that mirrors the Gift carousel, OR they need to be dynamically loaded by the WP REST API and React based on the ID number (date) of the Gift clicked on. The “prev” and “next” buttons need some style corrections (like text-alignment and z-index to place them OVER the Post border) as well as functionality. Ideally, if a user clicks “prev” or “next”, the Post background (dark blue) would remain unchanged, and only the Posts would slide left or right (as a carousel). Well, I decided that since I started having THIS problem with scaling the Gifts AND I was already having trouble with getting the carousel to display and function properly, I probably had an error in my code somewhere that I was overlooking. Therefore, I decided to start breaking apart all the various pieces and components of this project to take a closer look at each of them individually. From here, it allows me to continue working on the individual Components for the site even from my Windows computer. And once these pieces are perfected, I can then compile them all back together again as a “real” website. 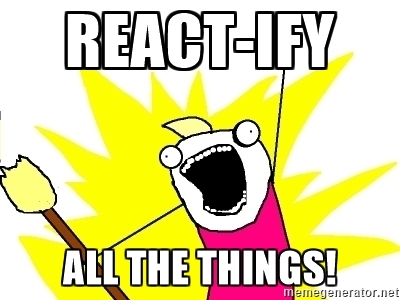 All the markup is now handled entirely by React. And now, I feel like I’m ready to continue with Ray Villalobos’ Course: Building a Web Interface with React.js to learn better how I can get these various Component pieces to interact with each other better.